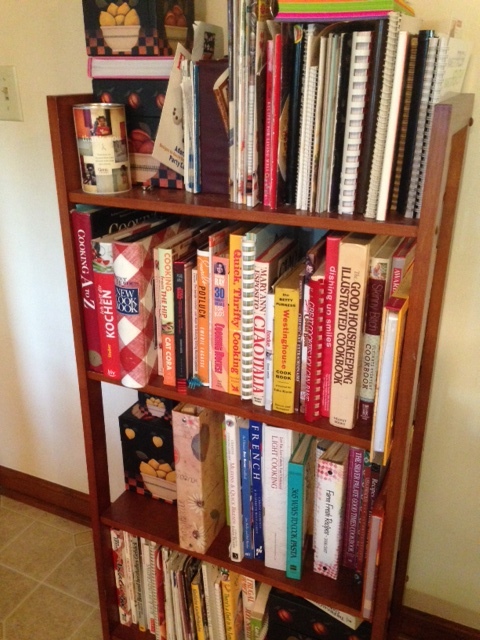 Lately, though, I notice my cookbooks gathering dust. Never fear, I’m still feeding my family, but unless I’m reaching for a specific recipe that resides in the pages of my collection, I find myself reaching for my phone or my iPad to search the internet for inspiration. I’m still trying to decide how I feel about that. My approach is the same; I read through a recipe to assess it. I compare several different options. I imagine the outcome. It just feels so…impersonal. I miss holding the pages and smelling the paper, not to mention the fact that the screen on my phone gets pretty nasty from my internet cooking forays. Still, it has its benefits. I have access to more resources than I could ever fit into my kitchen. I get the benefit of others’ reviews and commentary. [Note: ALWAYS read the commentary.] My cuisine choices are no longer limited by that which sits on my shelf. The world is really and truly at my fingertips. Accessibility. Anyone can find just about anything with an internet connection (free at most libraries for those who don’t have it at home). No longer are we limited by resources, e.g. how many/which cookbooks we can afford, what’s available in local stores, whom we know who can help. Competition. As a pretty firm believer in the corrections of the free market, I have to believe that increased accessibility and the corresponding increase in options will positively impact the quality of all. While things may look different in the end, I believe that survival of the fittest will make the winners–whatever they may be–far better than the original offering. I just have to be open-minded and keep a broad perspective. It’s cookbooks for me, but it may be something else for you–I think the lesson is universal. Still, if you borrow one of my cookbooks, please don’t forget to return it! My daughter’s social studies teacher hosted a cultural fair last spring where the kids could present their year-end country projects. The kids had worked in groups to create elaborate displays, learn facts and anecdotes, and even whip up samples of local cuisines. The teacher expected the cafetorium to be packed, so she asked parents to sign up to bring a variety of international dishes to feed the masses, potluck style. I volunteered to make cannoli. Okay, stop right there. Before I go any further, let’s all agree to ignore the notion that I shouldn’t have waited till the last day to get things done. This story won’t be any good if you won’t at least give me that much. Deal? On the day of the fair, I assembled my ingredients and made something close to a vat of cannoli filling. I had planned to buy the shells rather than make them myself, so around 3pm I took off for the grocery store. My usual store didn’t carry them anymore. And neither did the next one. Or the next one. Or the next one. With three hours left till the cultural fair, I was out of luck and out of time. No problem, I thought. I’m a resourceful person. I can figure this out. And I did. Spying filled cannolis in the pastry case at my local Fresh Market, I asked the clerk if she would be willing to sell me some of the empty shells I knew they had in reserve. I don’t know, she said. I wouldn’t know what to charge you. Is there someone you can ask? I persisted. Well, one bakery manager is at lunch, and the other one is on vacation, she replied, as if that were the end of the discussion. Surely, I said, we can figure this out. There has to be someone in the store who can help. Please. 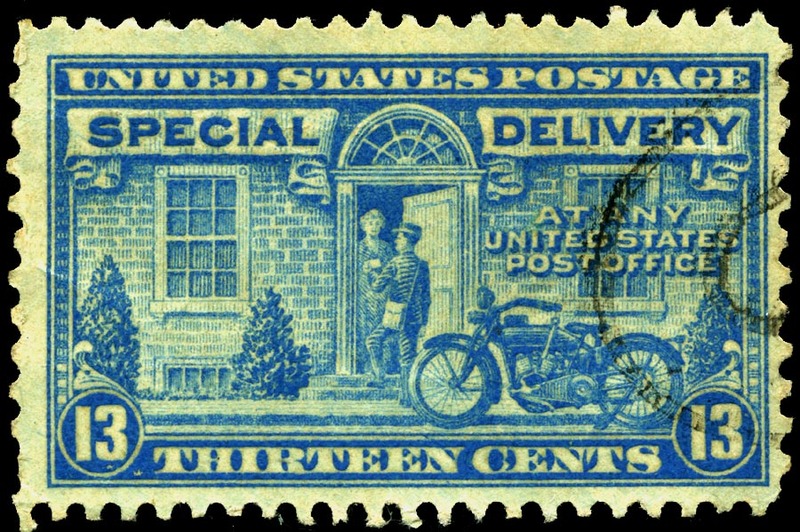 With a groan and a sigh, the clerk retreated. Several minutes later she picked up the phone and placed a call. After a round of hushed voices and furtive glances, she hung up the phone and returned to the counter. Sorry, she said breezily, I can’t. And just like that, with no further explanation, she turned around and walked away. I doubt the clerk has any idea what really transpired. Even in refusing to sell me the empty shells–I don’t believe she made anything resembling a valiant attempt on my behalf–and in purveying a haughty attitude about it, she wasn’t the one I resented. I resented Fresh Market. Perhaps she didn’t realize that everything she says and does while wearing her bakery duds and name tag represents the company. So how did she affect the store? Fresh Market lost a sale. They had the goods and I was willing to pay for them. A win-win turned into a lose-lose. Fresh Market ticked off a customer. 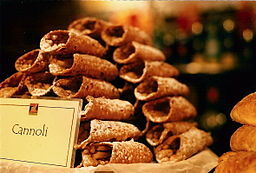 I not only felt mistreated by the clerk by her annoyed demeanor and lack of concern, but I also felt as if I were being strong-armed into buying the filled cannoli. Which, by the way, I did not do. Other people heard of my dissatisfaction with Fresh Market. While I refrained from taking a scorched earth approach, I definitely shared my frustration with several of my friends. Negative word-of-mouth is not helpful to any business. Fresh Market lost future sales. Oh, I’ve shopped at Fresh Market several times since that day, but I have yet to pull out my wallet at the bakery case. I’ll get my sweet treats elsewhere for a bit longer. Truthfully, I don’t really care about the cannoli shells (anymore), but I love the branding lesson here. It’s a great reminder that most often it isn’t the people in marketing who have the most impact on a brand–it’s the people talking to customers. P.S. In case you’re wondering, I trashed the cannoli filling. The cultural fair got mini eclairs as my contribution, and my daughter got an A+ on her project. Once there was a man who died and found himself at the entrance to the afterlife. On one side of him, he saw a huge banquet hall labeled Hell. 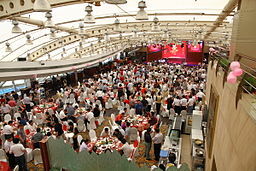 On the other side, he saw an equally huge banquet hall labeled Heaven. Both teemed with people, and the noise was deafening. When he went to investigate, he noticed something peculiar: no one in either hall could bend his elbows. Every single person’s arms were locked into a stick-straight position. Upon closer investigation, the man noticed that the people in Hell were emaciated and furious. They kept trying to feed themselves, but their locked elbows wouldn’t allow it. The people in Heaven, on the other hand [see what I did there? ], laughed and ate to their hearts’ content. You see, since their elbows wouldn’t bend to their own mouths, they had decided to feed each other. You can call the banquet halls whatever you want if you don’t like the Heaven and Hell labels, but the point remains the same. You’ll starve if you go through life trying to fill your own needs, but once you get the focus off yourself, you’ll end up stuffed. Business or personal life, it works the same. In recent years, I’ve noticed how often life throws at me exactly the thing I need at exactly the time I need it. Every time that happens, I’m awed when I finally make the connection. A few weeks ago, my daughter and I took a road trip and stopped for lunch in Terre Haute, IN. As we drove through town, I noticed a small church-like building with a sign that said CANDLES, Holocaust Museum. Intrigued as to why such a place would be in a dingy town along I-70, I filed it in my head for later exploration. A day or so later, when we were settled at our destination, I googled the place and found that Eva Kor, a survivor of both Auschwitz and Josef Mengele’s heinous medical experiments, owns and operates that museum. She also gives talks there every Wednesday and Saturday at 1pm. I’ve nursed an intense fascination with the events of World War II since childhood. Although it has come in phases, I was headlong in the middle of another one when I passed that building. My recent activity had included watching several documentaries, many of which included interviews with Eva Kor herself. Of course I adjusted our travel plans and made sure to hit Terre Haute on the way home on Wednesday, just in time for Ms. Kor’s talk. 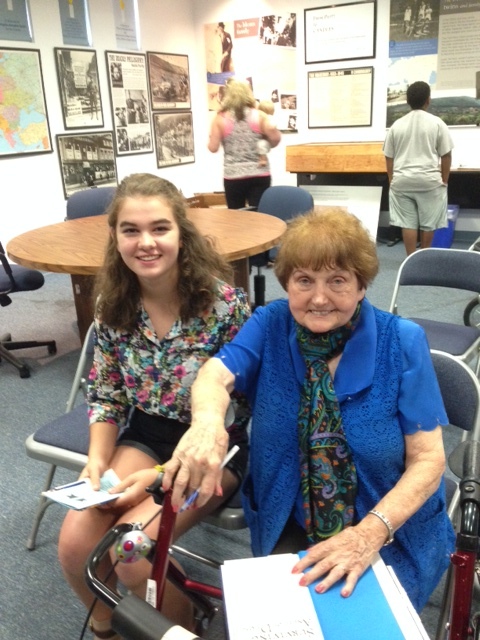 I was eager to hear what she had to say–a real live survivor!–and for my daughter to hear it, too. When the time came, we found ourselves face to face with the same diminutive woman I had seen in my living room, courtesy of Netflix. It felt very intimate, almost like a private conversation, as fewer than ten people showed up to hear her. I was crazy with excitement. And Ms. Kor did not disappoint. We heard what it was like for her to grow up persecuted as a Jew. To be hurt at school. To be rounded up with her family and loaded up in cattle cars. To arrive in Auschwitz for the selection. To have her mother’s outstretched arms reaching for her and her twin sister etched in her brain as the last time she saw her. To endure the unspeakable horrors of being part of Mengele’s experiments on twins. And finally, to be liberated from hell on earth as a ten-year-old girl. It was intense, emotional, and moving. What Ms. Kor really wanted to talk about was forgiveness. Through a variety of circumstances over the course of her life (read her book, or better yet, go see her in person–PLEASE), she decided she had to forgive the Nazis. Every single one of them. Hate was eating her alive, and forgiveness was her only way out. Many people can’t understand how or why she did it. They say that there was no repentance, no remorse. They say that the crimes were too huge. They say that her family would be ashamed. After hearing Ms. Kor talk, I respectfully disagree. Forgiveness, says Ms. Kor, isn’t about the person who did wrong. It’s about freeing oneself from the pain and burden of the transgression and not letting it define your life. It’s about taking away the power it has to control you. Only the forgiver can decide whether to forgive; if she waits for remorse or atonement, then the power still rests with the transgressor. Forgiveness doesn’t mean condoning the action or even having a relationship with the person; it means letting it go and moving on. You may not understand how she could forgive, and I’m sure I’ve not done her explanation justice. Go visit her, or at least poke around her website [http://www.candlesholocaustmuseum.org/], to hear it from her point of view. All I know is this: only days after I heard Ms. Kor speak, I find myself faced with a choice in a painful situation. I can let the anger and hurt take over my being, or I can forgive. I haven’t worked through all of the emotion just yet, but I know what choice I will make as I set my path. Forgive and heal. Humbling words from someone who has suffered more than most of us–divinely, fortuitously just when I needed to hear them. Forgiveness is not a pardon to those who have caused the injury, nor does it excuse the acts they used to cause it. These things are no longer the problem for the person who forgives. Forgiveness is the release of bitterness and indignation for our own personal healing. Forgiveness does not require forgetting. It only asks that we refuse to accept our pain as a part of ourselves.